In front, from left, are: Drake Sparling, Larry Frank, Kenzie Anderson, Jaira Houston, Greg Groninger and Austin Malott. Second row: Lay Lynn, David Graber, Elmer Graber, Terry Hoffman, Bruce Correll, Fred Hetzner, Kayla Gish, Rodney Gish, Julie Gish, Jared Anderson, Morris Day, Ron Norman, Byron Fites and Steven Raber. Third row: Buck Cunningham, Merrill Tibbets, Rod Frazier, Steve James, Austin Gish, Kole Kirkman, Missy Kirkman, Todd Kirkman, Mike Simpson, Travis Zile, Cletus Raber, Danny Detweiler and William Foust. Fourth row: John Crow Jr., Randal Chilcutt, Sam Chilcutt, KC Licklider, Wes Frank, Seth Forgey, Mark Simpson, Ed Denton, Rodney Maxwell, Jarett Houston, Jim Mitterling, Rudy Detweiler and Eric Miller. 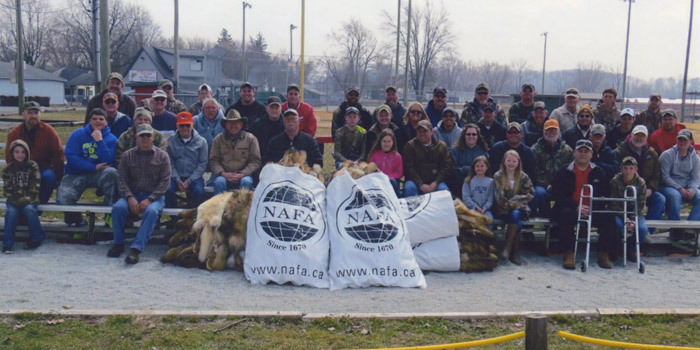 KOSCIUSKO COUNTY — Coyotes for Charity hunters from Carroll, Cass, Fulton, Grant, Howard, Huntington, Kosciusko, Marshall, Miami and Wabash counties harvested 410 coyotes this past season in their annual fundraiser for the American Cancer Society. This is the 12th year for the project, which started with four hunters and has grown to more than 120. All told, the hunters have harvested 2,002 coyotes over the years and donated $45,220 to the American Cancer Society. Money raised by selling the coyote pelts is matched by the Square D Foundation through the Relay for Life campaign and a generous Miami county resident. The coyote pelts were prepared for auction by Larry Frank from Macy. Bo Bodenheimer was the U.S. receiving agent for North American Fur Auctions in Toronto, Canada, where the pelts were sent to be sold.